The start of the baseball season is less than a month away. Every weekday until opening day, we'll be counting down, from No. 20 to No. 1, the most important Mets players for the upcoming 2010 slate. Today, No. 14, relief pitcher Ryota Igarashi. The Mets' primary Japanese import — the other is Hisanori Takahashi, who has actually been the better pitcher this spring — hasn't been blowing people away in the Grapefruit League, notching a 6.00 ERA so far. There's a small possibility that new signee Kiko Calero could compete for Igarashi's job, but Calero is hurt and hasn't shown much. The looming tower is Jenrry Mejia, but we'll talk about him tomorrow. On the whole, as of this point, the most likely bridge to Francisco Rodriguez is Ryota Igarashi, a pitcher you've likely never seen pitch and know nothing about it. 1. He just turned 30 years old. 2. He is signed for the next two seasons. 3. He was once a flamethrower, topping out at 98 miles per hour, but age and Tommy John surgery three years ago have slowed him down. 4. 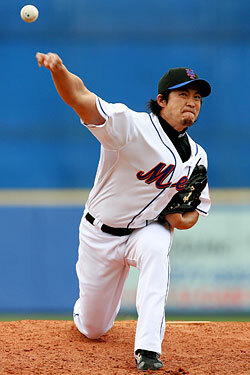 His strikeout rate in the Japanese League has been slowly dropping. 5. He hasn't thrown more than 57 innings in a season since 2004. 6. He's known for wildness, which is not exactly what you want from your eighth-inning reliever. 7. This is the only one that really matters: Back in Japan, he would sometimes enter the game wearing a mask and proclaiming himself "Swallows Man." You can see a picture of him in the mask right here. Handsome devil.